Oh mama, sometimes there’s a perfect storm of books all landing at once, a cosmic alignment which compels all of your favourite authors to complete their latest offerings within days of each other. Right now is one such blue moon occasion. Right after discovering that Ben H. Winters had completed his Last Policeman trilogy I discover there’s a new Laundry Files novel available (the one I’m reviewing here), followed immediately by the latest in Richard Kadrey’s insanely fun Sandman Slim series and the concluding chapter of Jeff VanderMeer’s thoroughly unsettling Southern Reach trilogy. Not to mention Robin Sloan sneaking in a prequel to one of my favourite books of last year, Mr Penumbra’s 24-Hour Bookstore. Happy is me. First up is Charlie Stross because, well, he’s just overall awesome and this may be the finest Laundry Files novel to date. So, to bring you up to speed in case you’re unfamiliar with this particular universe, Bob Howard was just a lonely computing science geek pottering around with algorithms in his flat. Unbeknownst to Bob it turns out that maths just happens to hold the key to accessing other dimensions and inviting their many-toothed and -tentacled denizens for dinner in our neck of the woods. Having been saved from unleashing screaming terror on suburban England he is inducted into The Laundry, a beyond-top-secret government organisation tasked with protecting the realm from threats unknowable, unnameable and indescribable. Think MI5 meets HP Lovecraft. Many (mis)adventures and near-death incidents later, Bob finds himself discreetly climbing the organisation’s ladder, secretly enlisted as the apprentice to the Eater Of Souls and attempting to maintain a steady relationship with his wife Mo, a one-woman supernatural heavy-weapons unit armed with a cursed violin. For all Bob’s dealings with terrors from beyond the imagination it is the laundry’s stultifying and suffocating bureaucratic culture which causes him most nightmares this time around. The powers that be have decided to encourage motivation and creativity through the time-honoured tradition of whip-cracking, forcing employees to devote and extra 10% of their time to personal projects, selected from a pre-approved list of course. Unfortunately Bob’s colleague Andy succeeds in summoning a rather large and peckish entity into his office, requiring the intervention of his boss Angleton (current Eater Of Souls) and very nearly causing a departmental collapse. This sets Bob off on his own course and before you know it there’s a pack of mathemagically-created vampires roaming London, pawns in a deadly game which will soon have The Laundry at its knees. 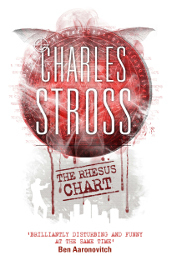 The Rhesus Chart, despite being the fifth full-length novel in the series, is an excellent jumping-off point for new readers. It seems Charlie wrote it with accessibility in mind, providing plenty backstory to established characters and concepts without ever coming across as dull or repetitive for seasoned fans. Not to get too spoilery but the plot leads to some dark places and the story ends with events which leave the series open to an almost fresh start and with the ever-approaching Case Nightmare Green as an increasingly palpable destination. If you don’t know what to expect already then you’re going to find nerdy references, horror, humour, fantasy, sci-fi and a healthy dose of well-read snark on display. Stross revels in his contempt for the excesses of the banking institutions which recently caused so much hardship for so many millions as well as his distaste for corporate and bureaucratic culture in general. The barbs he sends that way are always well-aimed, never excessive and invariably having you involuntarily chuckling on the bus as you read. If you’re already familiar with The Laundry Files then you need to read The Rhesus Chart as soon as possible. The characters and settings are that bit more fleshed-out and you can feel that Charles Stross is much more comfortable in creating the stories. There’s just such a natural feel about the whole thing and everything feels more substantial. What started as a jokey ‘Lovecraft-meets-the-civil-service’ tale has matured into a genuinely accomplished series and this is without a doubt the cream of the crop. If you’re a newb and don’t fancy trawling through the four previous installments (although you should) then you can happily pick up here without feeling you’re missing out. Given the almost Empire Strikes Back feeling to the ending I hope to the Elder Gods that Charlie’s already writing number six.